It is hard to choose from all the interesting places one can visit in London. Many people say that even two weeks would not be sufficient to see them all. Well, we had one more day, so we had to choose wisely. In the end it is really a question of personal preference: do you want something entertaining or with more historical value? We started our day with a visit to The Tower of London. The entry price is ₤21.45 per person (which by the way included a small donation of around ₤2, I do not remember how much exactly). The ticket offices are placed a bit odd outside the actual fortress, but there are huge signs leading people to them and they are actually in the way if someone comes via the tube to the Tower. The queues were surprisingly small (even though there were a lot of people visiting) so we went through the whole process in a couple of minutes. While the actual tour presents a lot of fortress related stuff (armors, weapons, cellars) I think most people visit the Tower of London to get a glimpse on the Crown Jewels. And maybe it is just me, but I was a bit skeptic about this: are tourists being let so close to one of the biggest treasures of the U.K.? Are the exposed artifacts really the real ones? “Well, yes dear they are. I know it is a bit of a shock, but they are!”, as the lady watching over the crowds of tourists responded to my seemingly naive question… It’s a shock isn’t it? 😀 . On top of that there are free shows while walking around in the Tower, with actors playing historic scenes right among the visitors. It was quite shock (again) for us to see that some people seemingly appearing from the 17th/18th century just appeared in front of us arguing about some prisoner who was locked in the Tower… anyway we quickly realized it is just a play, and we enjoyed it until the end :). 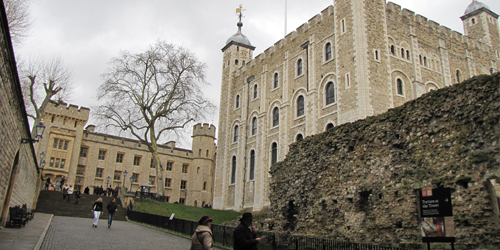 Our visit at the tower lasted about 2 hours and by the end we were quite overwhelmed by all the historic facts and information we learned that day… we were ready for a break and hit some of the ‘entertainment’-type POI-s of London: the Sealife London Aquarium. Why exactly this one? Well, it is really close to the other venues (right across Big Ben, next to London Eye) and if someone has never visited one, it can be a great experience 🙂 . The entry price to the aquarium for adults was ₤21.60 and for this one gets a decently built aquarium with its own tunnel below the sharks and sting-rays swimming around you. While I have been to other aquariums, I have never been to one with a tunnel, so that was a first to me. It offers a quite unique viewing angle and certainly has a “wow-effect” 😉 . After the relaxing one and half hours in the aquarium we got quite hungry, so we had to find something to eat. This time, for some reason, we were not in the mood for the traditional fish’n chips 😛 and we also needed a place to stay with WiFi connection. Well, where else to go than good old McDonald’s? I know it is a bit lame, but at that point it was perfect for us to recharge ourselves a bit before moving to the next venue. The next venue was the last for the day and we also had limited time to visit it. We were almost sure we cannot see everything, but we headed off anyway to get to The British Museum. Entering the museum is free of charge so it was a bit of a relief after the slightly overpriced first two venues… Having so little time to spare it was a great help to have a brochure (also free 😛 ) to help us organize our visit: it had solutions for 2-3 hour visits but also for one hour visits to just take you through the highlights (yeah, lame again, but when you are bounded by time, anything helps 😉 ). 1. Indeed, a few days is not enough to visit London. 2. Yes, we will definitely have to go back again :). After a long period of inactivity (we were moving 😀 ), I am now coming back with the continuation of my post-series about our trip to London (yes, there is more 🙂 ). This time I would like to write about something that is a bit more unusual for the average tourist visiting London: Camden Market. After some discussions about what to see in London we were advised by our hosts to visit this part of the city. It is great for buying souvenirs at a reasonable price and not only (at least this was the starting reason they convinced us with). 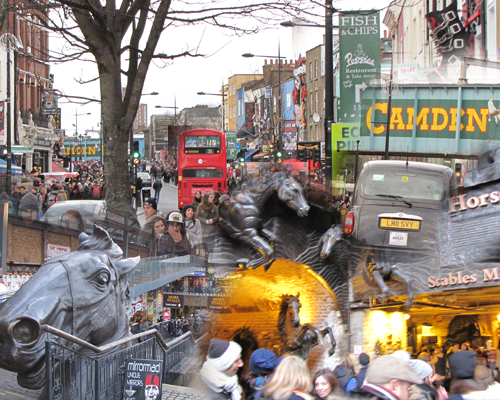 The place itself is located in Camden Town (duh…) and it is basically a series of markets, each having a theme of it’s own. While one can easily satisfy his/her thirst for souvenirs in the first few shops along the main road, the real surprise comes after accessing the inner labyrinths of the market: it’s HUGE. I am generally good at finding my way around, but this market-complex, I have to admit, was a challenge. One interesting thing I noted, was the multitude of nations having their own representatives at this market. You can find everything here from traditional local traders, through Italian, Mexican, Chinese and all the way to Indian traders. It is sometimes enough to check how many types of fast food you can buy here and you can immediately realize how big the world is 🙂 . My initial thought was that the merchandise will be all the same over and over again, but no: there is something new at every corner and you never know what product you may fall in love with at the next shop 🙂 . It took an entire day to stroll through the market, marking it the highlight of the day (well, that and the double-decker bus ride that we took to get there 😉 ). Now, that I am trying to write down, what really caught me, I cannot say anything specific. It is, I think, the multitude of things and the colorfulness of the market that catches you and takes you to another world. It is a thing people need to experience and not read about, so if you are in London, stop reading and just get to the market and enjoy it :). As I have written in the previous post, there are a lot of things to see in London, so it is really hard to pick one. In our case, our first full day of sightseeing was a really long walk but included a lot of the things that most sightseeing buses offer to show 🙂 . Given the fact that we had two full weekend days to choose from to do the big sightseeing stroll around London, we had to pick one. Usually there are two factors here: weather and if there is something interesting going on on any of the two days. The show ended at around noon, we took a few classic pictures with Buckingham Palace and headed off on The Mall towards Trafalgar Square. There was a big show going on here, but there was still room for street performers in front of the National Gallery which were quite interesting to watch. By this time the sun also came out with a quite powerful shine, so we took some time to enjoy the scenery. Next stop was Parliament Square and Westminster Abbey. Just the short stroll through the street connecting the two squares was a hustle. For this short 10 minute walk a strong wind has woken up and it also started to rain a bit (hence the need for a QUALITY umbrella). When we got to Parliament Square the sun was shining again and the winds have slowed down a bit. Again, we did not enter any of the buildings (the entry fee to Westminster Abbey is, I think, too much), but we heard Big Ben telling us the exact time (it was 2PM) 🙂 . A walk across Westminster Bridge offered us a classic view of the Houses of Parliament, but at this hour the sun starts shining from the direction of the building itself, so it is really hard to take a decent picture. It is best seen, I guess, in the morning. In addition, the winds tuned their power a bit up again and this was really intense while standing on the bridge. We skipped London Eye and headed to get something to eat. We found a great place which offered food “Enough to feed an elephant” (that was the name of it) on York Rd., in parallel with the great big wheel 🙂 . It was really time to get inside somewhere, because by this time it started to rain heavily, so we took our time with the food until the sun came out again (we did not have to wait too much). The next target was a bit further away from where we were, so we took the tube from Waterloo station to The Monument. The latter station is actually right next to the tower which gives its name. The Monument stands as a commemoration for the Great Fire of London. Visitors can climb up the long swirling staircase to the top for ₤3 and have a great view of London from there. It is a bit windy, but I think it is worth climbing. In the end, when you get down, they even give you some kind of diploma proving, that you climbed the 311 stairs all the way to the top 🙂 . 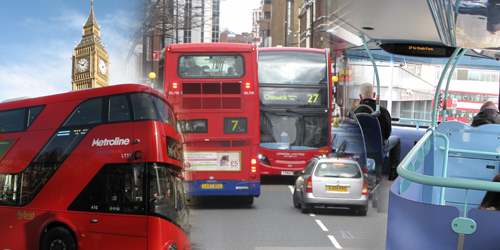 The bus puts you down in central London at Victoria Coach Station, you are happy that you have reached your destination but then start to scratch your head: “Now what?”… Luckily I did some research and I knew what the best option is to get around London: the Oyster Card. Well, in our case we did not have to buy it, because our friend who we visited bought two cards for us in advance. Actually, they can be bought at any metro station around the city, so travelers should really buy them. It helps a lot! So how does this work? Well, you buy the card (and by the way you receive a very nice card holder with it), then you can just charge it up (again, at any metro station) and each time you exit a metro station or enter a bus you touch it to a scanner which automatically calculates the transfer fee and deducts it from the card. Simple: no scanning/printing of tickets, no queues, just a really fast way of processing a lot of people going in every direction. What’s more, if you reach a top limit of around ₤10-₤15 per day it stops deducting any more cash… Neat 😉 . To top that, there are tons of metro lines and metro stations getting you from and to virtually any point within the city limits. I think there is no better alternative: the tube in London is THE best way to get around. If you want to enjoy some picturesque sightseeing also (well you are a tourist, so why not? 😛 ), there is no better way to do it in London, than hopping on to one of their big, bright, red double-deckers. We tried it, even from the front row of the upper deck (yes, we could not resist either…), and it was fun! The corners those buses take and the narrow streets they get around with great ease was astonishing. If you are in London: it is a must! One interesting thing that I saw (not only on the bus, but also in the metro), is that the interior coloring of the bus matches the line color that you are in (just to make sure you are not lost 😀 ). Of course if you are visiting London, you have to do a lot of strolling around on foot. During this time it happens a lot, that you have to cross the road. This is where it hits you for the first time: in the U.K. people are driving on the left. We were used to automatically first look left to see if something is coming… well in London you first check your right. I guess even the local administration knows how confusing this is, so to avoid problems at each crossing, there is a huge sign painted at the edge of the road: “LOOK RIGHT” (or “LOOK LEFT” in case of one way streets)… nice to know they care 😉 . And if we are at the subject of walking, be sure to carry an umbrella with you. It is London… do not expect a steady weather. During the four days we were there, we experienced three seasons: rainy&windy autumn, cloudy spring and sunny summer… each day… about three times a day. And a very important thing: make sure your umbrella is tough, otherwise it can get into the trashcan along the rest… the winds in London can get suddenly very, very strong 🙂 . But with so much transportation options available, it must mean that accessing sights in London is easy. Well, it is, but there are a lot of them. You would still need a few weeks to see most of them. We only had four days, so we had to choose. So which ones did we choose? I’ll write about them in my next post ;). After quite a lengthy planning, finally the day arrived: we were ready to embark on a trip to the largest city in Europe: London. We have booked our flight already back in November last year, so we had nothing else to do, than print our boarding passes and try not to oversleep (the flight was scheduled to take off at 06:45 in the morning). Having the tickets booked so early, we managed to buy our round-trip flight for two persons with WizzAir from Cluj to Luton Airport for as low as 842RON (~€187), which included also one checked-in luggage. So far everything was great ;). Due to the early departure time, we had woken up at 04:15 in the morning and after just about an hour and a half we have already passed the check-in process and were standing in line to embark the plane. Due to the deicing procedure, the plane took-off at around 07:10 and additionally we had a quite long flight. On top of that we could see hardly anything of the land below, so I was really glad they changed the Wizz-magazine since the last time I flew 🙂 . It was already around 08:10 (U.K. time) when we finally landed. I am saying “finally”, because the last few minutes were… well… “messy”, as the pilot also announced. We had to go through multiple layers of clouds and were approaching the runway in an angle which was far far away from straight… The whole experience, however, was actually OK, because by the time the plane really started to shake we got out of the cloud layer so everyone jumped to the windows to admire the beautiful, green, English countryside instead of worrying about the plane 😉 . The next challenge was the long-long queue at the passport control gates. I think we stayed there about an hour, so our plans to do a quick tour of the city center just before lunch was slowly fading away… Despite of the long queue, our morale did not fall: we made a quick cash withdrawal (there are some “free” cash withdrawal machines which accept a lot of cards) and were ready to search for our bus to London. Finding the right bus was also a piece of cake: there were some HUGE signs painted on the wall, about National Express who would take you to London Victoria station for as little as ₤10 round-trip. The buses start off from the coach station just outside the exit from bay number 10. Tickets can be purchased both inside the terminal and at the bus (there is no difference, the agent even accepts credit cards). We had a small issue here with the payment: although the sign said the trip only costs ₤10, this actually meant, that the whole round-trip costs ₤20 per person. (otherwise it costs ₤15 just one way, making the round trip cost ₤30). Luckily I have withdrawn enough money so I was able to pay without problems.